Semiconductor Engineering - Better Software. Faster! Semiconductor Engineering - Better Software. Faster! Home > System-Level Design > Better Software. Faster! New book looks at case studies and best practices of mobile, consumer, automotive and industrial applications. As virtual prototyping has seen a wide adoption over the last couple of years, it felt like the right time to work with industry leaders across multiple applications and publish a book that captures the best practices in virtual prototyping. As editor of the book: Better Software. Faster!, I had the privilege to work with some incredibly knowledgeable people who have been deploying virtual prototypes for many years. The book captures the main benefits of virtual prototyping as the key methodology to shift left the design cycle: namely reduce the overall time-to-market by starting software development before hardware availability. Better Software. Faster! features case studies and best practices from companies across mobile, consumer, automotive and industrial applications including: Altera, Bosch, Fujitsu, General Motors, Hitachi, Lauterbach, Linaro, Microsoft, Ricoh, Renesas, Siemens, Texas Instruments and VDC Research. As editor I can of course not do anything less than recommend you read the book, but really … do read the book ;-). Maybe the most compelling reason of all to get the book is that it is available for free as an eBook here. If you prefer a printed version, because there is still something nice about holding a book in your hands and going through the pages, you can order one on Amazon.com, Synopsys Press, or you can visit me at EE Live! 2014 at the Synopsys booth (#1924) in the San Jose McEnery Convention Center on Tuesday April 1st where we will hand out the first 100 copies of the book! To give you a sense of what the book is about, below is a high-level overview of the chapters and their content. I am convinced that this shift left methodology can help your company deliver better software, faster and as a result impact the entire product development cycle and increase product quality. Most of all, I hope you enjoy the read! Chapter 1: We start by reviewing software development complexity resulting from the race towards “smarter” products, including the multicore challenge, the tight balance between power and performance requirements and the growing concern about security. Chapter 2: We introduce virtual prototyping as the engine behind “shift left” and explain the main benefits of this methodology to help software developers cope with tight software schedules and complex software bring up, test and debug challenges. Case studies by TI, Siemens and Altera. Chapter 3: We illustrate the advantages of using a combined solution, consisting of a virtual prototype and debug and analysis tools for software bring up tasks like boot sequence development, operating system porting and driver development. Case studies by Fujitsu, TI and Altera. Chapter 4: We describe how the automotive industry is becoming more software centric and dealing with functional safety questions. Virtual prototypes are helping by providing key capabilities to enable extensive software testing. Case studies by Bosch, Hitachi and General Motors. Chapter 5: We examine how virtual prototypes enable faster software development across the entire electronic supply chain. Case studies by Altera, Linaro and Renesas. 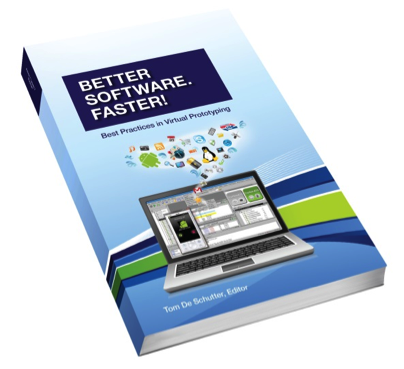 Chapter 6: For specific software bring up and validation use cases and for software driven verification it can be useful to combine virtual prototypes with hardware-based prototyping and verification solutions like FPGA-based prototypes and emulators. Case study by Ricoh. Chapter 7: Semiconductor Engineering Editor-in-Chief Ed Sperling provides his view on the electronics industry and discusses the case for virtual prototyping with industry experts from Microsoft, Lauterbach and Synopsys.